An album in concert, as a Best Of…, is often the best way to start exploring the world of an artist. And I would insist on saying that it's even more true for EM because the Live aspect, this friendship and communication between musicians does that some of them give more by stretching a solo or by adding riffs here and there, is returned with such a similarity that we wonder: is it really Live or prerecorded? Don't get this wrong! A lone artist in concert who produces music like a band in studio can't do it on stage unless he has prerecorded elements. And even with that secured background, some artists dare! Like on this “Live O5/11/2016” from MoonSatellite! Recorded during his performance at the Théâtre de la Foucotte in Nancy, on May 11th 2016, “Live O5/11/2016” doesn't only contain some great music from the best era to date of Lone Wolf, be his delicious albums Whispers of the Moon and Sleep Awake released in 2015, but the brilliant artist of Lyon injects just enough nuances to give more depths to titles which have deeply charmed us some 2 years before, besides adding a new title which aims to be a good introduction to the following works of MoonSatellite. A delight for his fans and a feast, for the other fans to be, of a wonderful EM soaked with these wonderful perfumes of the France School cosmic rock of the 70's. "Sequences Are Beautiful" is the title which underwent the most beautiful transformation here with percussions which give to it a more rock tonus. Also taken from the Whispers of the Moon album, "Shadows Part II" is adorned by layers of voices in its cosmic rock portion. "Sleep Awake Part II" and "Sleep Awake Part IV", although its finale is shorter, remain rather faithful to the versions from the album of the same name, except some synth effects which give a different aspect to the harmonious portion of "Sleep Awake Part II". "Among Waves Part III" seems to be the little gift from Lone Wolf to his fans. The opening offers oscillating loops of sequences with fine nuances in the impulses which seduces our state of hypnosis. Another line of sequences is added and revolve between both ascending movements while the percussions solidify an approach of slow cosmic rock which is wrapped by very good and melancholic solos of which the romantic and dark approaches will pursue their adventures in Sessions or in Dark Summer. Un album en concert, comme un Best Of…, est souvent le meilleur moyen de partir à la découverte d'un artiste. Et j'insisterais pour dire que c'est encore plus vrai pour la MÉ puisque l'aspect Live, cette promiscuité entre musiciens qui fait que certains d'entre eux débordent en prolongeant un solo ou en ajoutant des riffs ici et là, est rendu avec une telle similarité que l'on se demande: est-ce vraiment du Live ou du préenregistré? Faut pas se faire d'illusions! Un artiste seul en concert qui produit de la musique comme un groupe en studio ne peut pas le faire sur scène, à moins qu'il ait des éléments préenregistrés. Et même avec ce sentiment de sécurité, certains artistes osent! Comme dans ce “Live O5/11/2016” de MoonSatellite! 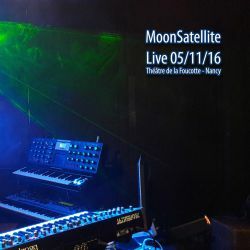 Enregistré lors de sa performance au Théâtre de la Foucotte à Nancy, le 11 Mai 2016, “Live O5/11/2016” ne regroupe non seulement des titres soutirés lors de la période faste de Lone Wolf, soit les succulents albums Whispers of the Moon et Sleep Awake parus en 2015, mais le brillant artiste de Lyon injecte juste assez de nuances pour donner plus de profondeurs à des titres qui nous auront charmer quelques 2 ans auparavant, en plus d'ajouter un nouveau titre qui est une belle introduction aux œuvres subséquentes de MoonSatellite. Un délice pour ses fans et un festin, pour les autres nouveaux fans à devenir, de merveilleuse MÉ imbibée de ces merveilleux parfums de rock cosmique de l’École de France des années 70. "Sequences Are Beautiful" est le titre qui a subi la plus belle transformation ici avec des percussions qui lui ajoutent plus de tonus rock. Aussi tiré de l'album Whispers of the Moon, "Shadows Part II" est agrémenté par des nappes de voix dans sa portion rock cosmique. "Sleep Awake Part II" et "Sleep Awake Part IV", quoique sa finale soit plus courte, restent assez fidèle aux versions l'album du même nom, mis à part quelques effets de synthé qui donnent un aspect différent à la portion harmonique de "Sleep Awake Part II". "Among Waves Part III" semble être le petit cadeau de Lone Wolf à ses fans. L'ouverture offre des séquences aux boucles oscillatrices avec des fines nuances dans les impulsions qui séduit notre état d’hypnose. Une autre ligne de séquences s'ajoute et gravitent entre les deux mouvements ascendants alors que les percussions solidifient une approche de lent rock cosmique qui se voit être enveloppé de beaux solos tout mélancoliques et dont l'approche romanesque et sombre poursuivra son aventure dans Sessions ou dans Dark Summer. Cinq titres ne font pas un Best Of…, ni ne mesurent la grandeur d'un artiste. Mais “Live O5/11/2016” est un excellent départ pour s'initier à la musique de MoonSatellite. Et par la suite, vous découvrirez un artiste qui dépassera vos attentes. 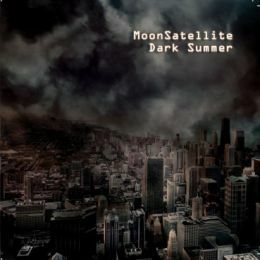 For MoonSatellite, “Dark Summer” marks a turning point in his career. First of all, Lone Wolf bought to himself new toys and has reconfigured his studio in order to obtain the best sound possible from his instruments with the participation and the patience of Gilles Leroy. The fans and the friends of Marc who were able to follow the evolution of these works via Facebook, as well as the elaboration of some titles which were going to appear on his new album. All of this results in a strangely dark album where we guess a Lone Wolf who has a rather dark vision of the future or who had a nasty summer with mixed emotions and admirably transposed them in music on “Dark Summer”. Don't look for furious rhythms here. All of them are boned to make plenty of room for these delicious cosmic rhythms and these melancholic melodies which decorated the landscapes of the French EM in the 70's. But “Dark Summer” is not deprived of interests for all that! Oh that not … There is a level of emotion here which transcends the best opuses of MoonSatellite with 8 similar structures. Each of those shows subtle nuances and amplify from titles to titles this continual presence of nostalgic emotions which decorate the cosmic landscapes of this other very beautiful album from MoonSatellite. And as usual there are these magic moments, unique to the music of Lone Wolf, which make raise our hairs of the arms, if not of our backspine. "Variation #1" begins this new MoonSatellite odyssey with an approach shaded of romanticism. A somber romanticism sculpted by a soft structure with lines of more or less dreamy sequences which skip delicately in a cosmic soundscape. The decoration is rich with its full of interstellar elements where layers, illuminated by a suspicion of melancholic voices, wrap "Variation #1" with a soft and comforting aroma of ether. "Variation #2" sniffs at the ashes of "Variation #1" to get us out of our momentary musing with a stream of intensity forged by bass pulsations which go hop up and down and a movement of a more fluid sequencer which makes its keys flicker vividly. This phase of rhythm stays in the ambient domain, be a cosmic rock, with a rich decoration always well embellished of sonic images whereas the voices, and our ears, are enthralled by the multiple synth solos which respect this aura and the imprint of nostalgia which roams all over the 8 variations of “Dark Summer”. After a "Variation #3" which regroups the main elements of the first 2 titles of this new opus from Lone Wolf, "Variation #4" increases the degree of intensity with a very good line of bass which solidifies a structure slightly more lively but also fed by increasing elements of melancholy. The movement of the sequencer makes skip and waltz its keys in a soundscape blurred of this layer of darkness which wraps the essence of “Dark Summer”. We dive literally here in the heart of the French cosmic rock of the 70's with this structure which floats according to its numerous solos loaded of melancholic melodies. "Variation #5" is this kind of title that brands our ears. The movement always remains so delicate as these lyrical odes which wrap the gloomy innocence of “Dark Summer”. But the sequences unfold here a superb march of nostalgia here with keys which alternate with a swiftness repressed by a veil of dusts crumbling from dying stars. The bass line spreads its veil of darkness, amplifying even more the presence of intensity which wraps this superb title. And if we find this moment attractive, it's nothing compared with the chants of the synth which throws a shroud of tears between our ears. Wonderful! "Variation #6" follows a little the curves of "Variation #5", but with more fluidity in the movement and in the harmonies of the synth. The 2nd part of the title waltzes with so much grace as a ballerina on a carpet of eroded shards. After an introduction furnished by a choir of austere psalms, "Variation #7" presents the most livened up part of “Dark Summer” with impulses of a good line of bass. The crystal tone sequences ring a sibylline tune which is chased by these lines of chorus and by another nice synth solo in the vintage pattern of the 70’s French School. "Variation #8" ends “Dark Summer” with a livelier movement, we always stay in the field of ambient rhythms here, which breathes like a moment of freedom found through an intensely melancholic album which seduces just as much as the previous works of MoonSatellite. Even if clearly more ambiospherical. Nobody can be disappointed here. Pour MoonSatellite, “Dark Summer” marque un point tournant dans sa carrière. Tout d'abord, Lone Wolf s'est acheté des nouveaux jouets et a reconfiguré son studio afin d'obtenir le meilleur son possible de ses instruments avec la participation et la patience de Gilles Leroy. Les fans et amis de Marc ont pu suivre l'évolution de ces travaux via Facebook, ainsi que l'élaboration des titres qui allaient figurer sur son nouvel album. Il en résulte en un album étrangement obscur où on devine un Lone Wolf qui a une vision assez sombre du futur ou qui a passé un sale été avec des émotions aussi multiples que contrastantes et qui sont admirablement rendues en musique sur “Dark Summer”. Ne cherchez pas des rythmes endiablés ici. Toute forme de rythmes est désossée afin de laisser toute la place à ces délicieux rythmes cosmiques et ces mélodies mélancoliques qui ornaient les paysages de la MÉ française dans les années 70. Mais “Dark Summer” n'est pas dénué d'intérêts pour autant! Oh que non…Il y a une forme émotive ici qui transcende les meilleurs opus de MoonSatellite avec 8 structures similaires. Structures qui sont présentées avec de subtiles nuances et amplifient de titres en titres cette continuelle présence d'émotions nostalgiques qui ornent les paysages cosmiques de ce très bel album. Et comme toujours il y a ces moments, uniques à la musique de Lone Wolf, magiques qui nous font lever les poils des bras, sinon du dos. "Variation #1" débute cette nouvelle odyssée de MoonSatellite avec une approche teintée de romantisme. Un romantisme sombre sculpté par une structure douce avec des lignes de séquences plus ou moins rêveuses qui sautillent délicatement dans un panorama cosmique. Le décor est riche avec son plein d'éléments interstellaires où des nappes, enluminées par un soupçon de voix mélancoliques, enrobent "Variation #1" d'un doux et réconfortant parfum d'éther. "Variation #2" renifle les cendres de "Variation #1" afin de nous soutirer de notre rêverie momentanée avec un flot d'intensité forgé par des pulsations de basse trépignantes et un mouvement du séquenceur plus fluide qui fait papillonner ses ions avec vivacité. Cette phase de rythme reste dans le domaine ambiant, de rock cosmique, avec un riche décor toujours bien imagé tandis que les nappes de voix, et nos oreilles, sont subjuguées par les multiples solos de synthé qui respectent cette aura de nostalgie et dont l'empreinte rôde tout autour des 8 variations de “Dark Summer”. Après un "Variation #3" qui regroupe les principaux éléments des 2 premiers titres de ce nouvel opus de Lone Wolf, "Variation #4" augmente le degré d'intensité avec une très bonne ligne de basse qui solidifie une structure légèrement plus vivante mais aussi nourrie d'éléments de mélancolie accentués. Le mouvement du séquenceur fait sautiller et valser ses touches dans un paysage sonique embuée de cette couche d'obscurité qui enveloppe l'essence de “Dark Summer”. Nous plongeons littéralement au cœur du rock cosmique français des années 70 avec cette structure qui flotte au gré de ses nombreux solos porteurs de mélodies mélancoliques. "Variation #5" est ce genre de titre qui marque nos oreilles au fer rouge. Le mouvement reste toujours aussi délicat que ces odes lyriques qui enveloppent la sombre candeur de “Dark Summer”. Mais les séquences affichent une splendide marche de la morosité avec des touches qui alternent avec une vélocité réprimée par un voile de poussières d'étoiles mourantes. La ligne de basse étend son vélum d'obscurité, amplifiant encore plus la présence d'intensité qui recouvre ce superbe titre. Et si on trouve ce moment séduisant, ce n'est rien comparé avec le chant du synthé qui jette un voile de larmes entre nos oreilles. Splendide. "Variation #6" épouse un peu la courbe de "Variation #5", mais avec plus de fluidité dans le mouvement et dans les harmonies du synthé. La 2ième partie du titre valse avec autant de grâce qu'une ballerine sur un tapis de tessons érodés. Après une introduction garnie par une chorale de chants austères, "Variation #7" présente la partie la plus animée de “Dark Summer” avec des impulsions d'une bonne ligne de basse. Des séquences cristallines tintent et forment un chant sibyllin qui est pourchassé par ces lignes de chœur et par un autre beau solo de synthé en mode vintage années 70 de l'École Française. "Variation #8" clôture “Dark Summer” avec un mouvement plus vif, on reste toujours dans le domaine des rythmes ambiants, qui respire comme un moment de liberté retrouvé à travers un album intensément mélancolique qui séduit tout autant que les œuvres précédentes de MoonSatellite. Et ce même si nettement plus ambiosphérique. I'm telling you from the outset, “Move” is quite a change of direction compared to the album Distance which was released in 2015. Less rock with a Max Schiefele's guitar less omnipresent, this second album of the German trio Pyramaxx is more carried towards an EM more Berliner with structures where the hypnotic and progressive styles of the Berlin School cross an approach always a little bit rock of which the evolution ends sometimes in a kind of EDM. A beautiful album with nice ideas which has everything to seduce the most demanding, because here the signature of Pyramaxx glitters with a little something which feeds the curiosity of our ears. We are going to explore the new Pyramaxx with a title in a very Berlin School style. The first seconds of "Amalthea" present a nebulous introduction with a mini concert of twisted metal from where emerges a splendid line of sequenced rhythm a la Tangerine Dream. This rhythm glitters with wide oscillations, sculpturing these perpetual upward movements which rivet us to our armchair. Effects of vaporous voices and other spectral electronic effects decorate this delicious movement which increases a little bit the velocity as the seconds pass. Sequences are very in the Chris Franke model with short adjacent lines which run away from and propose another more nervous alternative. Actives, the synths inject a very creative soundscape with these effects but also with layers in the shape of riffs and some hypnotic harmonic loops which charm and which also lead "Amalthea" towards a more rock finale. Discreet until then, Max Schiefele feeds the greediness of the percussions with a series of very rock riffs and solos which have made the charms of Distance and of the first albums of Axess/Maxxess. "Amalthea" sets the tone to a much diversified album. "Marrakesh" is a true value with a good electronic rock loaded of the Middle East perfumes. The percussive effects and the organic bass tones are superb on this title which gave me this taste to plunge again into the universe of Paul Haslinger and of his album World Without Rules. "Marrakesh" nests in my iPod, section Best titles of 2017, from the first day that my ears met “Move”. "Pangaea" is not outdone with a good rock as catchy as its very good melody. It's very electronic with a mixture of TD of the Melrose years and a Jean-Michel Jarre in mode seduction for a more adolescent audience. "Obsession" brings us to another level with a very film intro where bellowing and other effects of voices as well as intense and nerve-racking effects of percussions dominate the atmospheres. A more ethereal phase extricates itself from this magma full of suspense before a light movement of harmonious loops espouse those sequences as frivolous as the evasive melody. What strikes here is this new sound signature of Pyramaxx which is more perceptible in this long evolutionary title. The game and the effects of percussions are no stranger to this signature, as well as this approach of Dance Music marinated in Techno and combined to a Rock very stylized by a decoration raised by a truck of effects. So, it's at each new listening that we rediscover titles as "Obsession" and "Delusion", a little softer with a more present Maxxess here, as well as the stunning "Move" and its polymorphic structure which sways between quiet vibes and a rock in an impeccable soundscape. By far the most sophisticated of the titles of Pyramaxx! Between the ballad and the cosmic dioramas, "Visions" ends “Move” with a nice introduction of atmospheres. Synth waves rise in crescendo, breathing another part of intensity which lies dormant all over the 63 minutes of this Pyramaxx's 2nd album. Adorned of a cosmic landscape, this opening goes overflowing over a delicate movement of sequences which sparkles under breezes become warmer and some harmonies, in the form of solos, coming from the guitar of Maxxess. Evolving by phases in crescendo, "Visions" accentuates a little the pace, under some delicious knocks of percussions which resound like metallic whips, one of the seductive elements in this album, keeping this hypnotic movement in the spheres of a cosmic ballad. This is very good. “Move” is in the continuity of the works of Pyramid Peak, guitar in more and a production with a sound aestheticism which transcends a little the style of the Peak. There are very strong moments on this album which should please undoubtedly the fans of the Peak and the fans of a Berlin School style perfumed from the fragrances of Tangerine Dream. From Sorcerer to Melrose! Je vous le dis d'entrée de jeu, “Move” est tout un coup de barre comparé à l'album Distance paru en 2015. Moins rock avec une guitare moins omniprésente de Max Schiefele, ce deuxième album du trio Allemand Pyramaxx est plus porté vers une MÉ plus Berliner avec des structures où le style hypnotique et progressif du Berlin School croise une approche toujours un peu rock et dont l'évolution finit parfois dans un genre de EDM. Un bel album avec de beaux flash qui a tout pour séduire les plus exigeants, car ici la signature de Pyramaxx resplendit d'un petit quelque chose qui alimente la curiosité de nos oreilles. On part à la découverte du nouveau Pyramaxx avec un titre dans le genre très Berlin School. Les premières secondes de "Amalthea" présentent une introduction nébuleuse avec un mini concert de métal tordu d'où émerge une superbe ligne de rythme séquencé à la Tangerine Dream. Ce rythme resplendit avec de larges oscillations, sculptant ces sempiternelles mouvements ascensionnels qui nous rivent à notre fauteuil. Des effets de voix vaporeuses et autres effets électroniques spectrales ornent ce délicieux mouvement qui augmente quelque peu la vélocité à mesure que les secondes passent. Les séquences sont très dans le modèle Chris Franke avec de courtes lignes adjacentes qui fuient et proposent une autre alternative plus nerveuse. Actifs, les synthés injectent un panorama sonore très créatifs avec ces effets mais aussi avec des nappes en forme de riffs et des boucles d'harmonies hypnotiques qui charment et qui conduisent aussi "Amalthea" vers une finale plus rock. Discret qu'alors, Max Schiefele nourrit la voracité des percussions avec une série de riffs très rock et des solos qui faisaient les charmes de Distance et des premiers albums de Axess/Maxxess. "Amalthea" donne le ton à un album très versatile. "Marrakesh" est une valeur sure avec un bon rock électronique aux saveurs du Moyen-Orient. Les effets percussifs et la basse organique sont superbes sur ce titre qui me refait plonger dans l'univers de World Without Rules par Paul Haslinger. "Marrakesh" niche dans mon iPod, section Meilleurs titres de 2017, depuis la première fois que mes oreilles ont croisé “Move”. "Pangaea" n'est pas en reste avec un bon rock aussi accrocheur que sa très belle mélodie. C'est très électronique avec un mélange de TD des années Melrose et un Jean-Michel Jarre en mode séduction d'un public plus adolescent. "Obsession" nous amène à un autre niveau avec une intro très cinématographique où beuglements et autres effets de voix ainsi que des effets de percussions intenses et angoissants dominent les ambiances. Une phase plus éthérée s'extirpe de ce magma plein de suspense avant qu'un léger mouvement de boucles harmoniques épousent des séquences aussi frivoles que cette mélodie évasive. Ce qui frappe est cette nouvelle signature sonique de Pyramaxx qui est plus perceptible dans ce long titre évolutif. Le jeu et les effets de percussions ne sont pas étranger à cette signature, de même que cette approche de Dance Music marinée dans du Techno et combinée avec du Rock très stylisé par un décor rehaussé par une pléiade d'effets. Ainsi, c'est à chaque nouvelle écoute que l'on redécouvre des titres comme "Obsession" et "Delusion", un peu plus doux avec un Maxxess plus présent ici, ainsi que l'étonnant "Move" et sa structure polymorphique qui tangue entre ambiances et rock dans un impeccable décor sonique. De loin le plus raffiné des titres de Pyramaxx! Entre la ballade et les dioramas cosmiques, "Visions" clôture “Move” avec une belle introduction d'ambiances. Des ondes synthétisées montent en gradation, insufflant un autre volet d'intensité qui sommeille dans chacun des titres de ce 2ième album de Pyramaxx. Ornée d'un panorama cosmique, cette ouverture se jette sur un délicat mouvement de séquences qui scintille sous les brises devenues plus chaleureuses et quelques harmonies, sous forme de solos, de la guitare à Maxxess. Évoluant par phases en crescendos, "Visions" accentue un peu la cadence, sous de délicieux coups de percussions qui résonnent comme des fouets métalliques, un des éléments séducteurs dans cet album, gardant ce mouvement hypnotique dans les sphères d'une ballade cosmique. 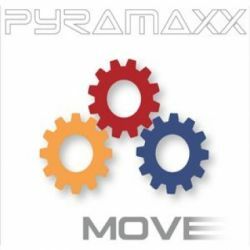 “Move” est dans la continuité des œuvres de Pyramid Peak, guitare en plus et réalisation avec un esthétisme sonique qui transcende un peu le style du Peak. Il y a de superbes moments sur cet album qui devrait plaire assurément aux fans du Peak et aux amateurs d'un style Berlin School parfumé des fragrances de Tangerine Dream. De Sorcerer à Melrose! After a short sinister wave, seraphic songs flood our ears with slow orchestral waltzes where are trapped some electronic effects embalmed of a cosmic touch. Faithfull to the mark of Pyramid Peak, the introductions of the long evolutionary titles are sculptured with interchangeable elements which have this gift to draw our attention. Here, orchestrations get lost in the charms of synthesized songs while the effects borrow other tones. The universe of the Peak remains always constantly evolving, even when it's very slow mutations. Orchestrations and songs of synths are exchanging the introductory harmonies while discreetly the sound of ringings forms a first line of rhythm. An ambient rhythm which convulses subtly with jolts knotted around a line of continual riffs. Slowly, "The Journey" restores this line of charm between the unconditional fan of Pyramid Peak, whom I am, with a crowd of sound elements which lead to predict any rhythmic load at any time. Percussive effects, and their echoes, feed this perception while the synths draw some kind of celestial arabesques which sneak between these ringings that stimulated the opening of "The Journey". The movement gets stir a little before the point of the 7 minutes. Sequences, percussions and pulsations form a spasmodic movement which break over towards these delicious cosmic rock unique to the Peak's charms. Very Tangerine Dream layers decorate this rhythmic progression whereas that are always rolling these electronic embroideries which sing like some nightingales of another planet. The synth solos are splendid with these fragrances of ether which invalidate their furies without eliminating at all their harmonious charms. The minimalist structures are at the heart of the Pyramid Peak concept and at no time they guide us towards a sensation of tiredness of the listening. And even after 4 years of absence, the magic is always present. "The Journey" offers these little sonic treats, both in the rhythms as in the effects, which inflate admirably its crescendo. Like this other line of sequences, always very TD, which strolls behind these synth solos and which will redirect the cosmic rhythm of "The Journey" towards a more ambiospherical phase where the rhythmic elements remain on the alert, because "The Journey" will resume another structure of rhythm, more moderate, with synth solos always so charming. Warning! The credibility of the author of this review could be soiled because he is a die-hard fan of Pyramid Peak's music. But honestly, I don't believe that it will change anything at all; “Roots” survives very well to the colossal Anatomy published at the very end of 2013. Structured around 4 long titles in minimalist mode and always very evolutionary, “Roots” proposes a journey between the various stages of Pyramid Peak since Ocean Drive until this day. We find thus many cosmic elements there, which fed the atmospheres of the first albums of the Peak, as well as these movements of sequencer which structure these rhythmic crossroads in constant movement and impulses of crescendo which constantly gave gooseflesh to us. And as nothing is left at random in the wonderful universe of the Peak, the duet Andreas Morsch and Axel Stupplich injects some silky orchestrations which amplify even more the intensity of the rhythmic parameters of which the diverse transformations work inside amazing synths soloes which, besides the harmonious effects, throw layers of mists and of voices as in the nice time. The title-track is more ambiospherical and its intro resounds like Tangerine Dream of the 70’s with foggy layers and with small harmonious phases which generate a crowd of memories. A pasty voice and samplings of voices describe the story in music of the Peak, introducing a rhythmic portion livened up by a crossing between sequences and percussions before the synths loosen loops of ambient vibes which will guide us in this approach of a duck cackling an organic structure. The movement limps with a subtle fluidity under an avalanche of other great solos. It's the kind of title that makes us travel through our dreams. "Milestones" is the key point of “Roots” with some nice long minutes which pull us in the territories of Klaus Schulze and his collaboration with Pete Namlook in The Dark Side of the Moog IX. Wonderful! From slow to undecided, the rhythm progresses with heavy percussions which hammer a peaceful ascent of the sequencer. The solos inject ink of fire which draw lazy volutes of which the twists wind up and crumple on a cosmic rock which will explode a little after the point of 11 minutes. The sequencer is lively and oscillates swiftly under superb synth solos always very musical. We listen on a loop! 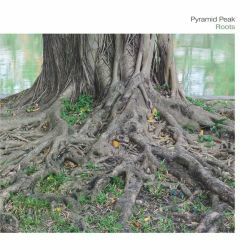 Shorter title of this last adventure of Pyramid Peak, "Offshore" starts slowly in order to expose us to a structure of rhythm which evolves as if Chris Franke would be behind the sequencer. The sequences are agile and get jostle with fluid leaps, exposing other sequences which join a phase which oscillates as reeds under hot winds and of which the breezes are filled of splendid seraphic songs. Songs which are present all over “Roots” which amazes even more with its inescapable structures of rhythms in constants evolution and which make of the music of Pyramid Peak the rendezvous of the followers of the Berlin School, as retro as new genre. Après une courte onde sinistre, des chants séraphiques inondent nos oreilles avec de lentes valses orchestrales où sont piégés des effets électroniques embaumés d'une touche cosmique. Fidèle à la marque de Pyramid Peak, les introductions des longs titres évolutifs sont sculptées avec des éléments interchangeables qui ont ce don d’attirer notre attention. Ici, les orchestrations se perdent dans les charmes de chants synthétisés alors que les effets empruntent d'autres tonalités. L'univers du Peak reste toujours en constante évolution, même lorsqu'il s'agit de très lentes mutations. Les orchestrations et les chants des synthés s'échangent les harmonies introductives alors que discrètement le son de tintements forme une première ligne de rythme. Un rythme ambiant qui convulse subtilement avec des saccades nouées autour d'une ligne de riffs continuels. Doucement, "The Journey" rétablit cette ligne de charme entre le fan inconditionnel de Pyramid Peak, ce dont je suis, avec une foule d'éléments soniques qui laissent présager une quelconque charge rythmique à tout moment. Des effets percussifs, et leurs échos, alimentent cette perception alors que les synthés dessinent des arabesques célestes qui se faufilent entre ces tintements qui stimulaient l'ouverture de "The Journey". Le mouvement s'agite un peu avant la barre des 7 minutes. Les séquences, les percussions et les pulsations forment un mouvement spasmodique qui débouchent vers ces délicieux rock cosmique unique au Peak. Des nappes très Tangerine Dream ornent cette progression rythmique alors que roulent toujours ces broderies électroniques qui chantent comme des rossignols d'une autre planète. Les solos de synthé sont splendides avec ces fragrances d'éther qui invalident leurs fureurs sans entacher pour autant leurs charmes harmoniques. Les structures minimalistes sont au cœur du concept de Pyramid Peak et en aucun temps elles nous guident vers une sensation de lassitude de l'écoute. Et même après 4 ans d'absence, la magie est toujours présente. Et "The Journey" offre ces petites gâteries soniques, tant dans le rythme que dans les effets, qui gonflent admirablement son crescendo. Comme cette autre ligne de séquences, toujours très TD, qui flâne derrière ces solos de synthé et qui redirigera le rythme cosmique de "The Journey" vers une phase plus ambiosphérique où les éléments rythmiques restent en alerte, car "The Journey" reprendra une autre structure de rythme, plus tempérée, avec des solos de synthé toujours aussi charmeurs. Avis! La crédibilité de l'auteur de cette chronique pourrait être entachée puisqu'il est un fan fini de la musique de Pyramid Peak. Mais honnêtement, je ne crois pas que ça change quoi que ce soit; “Roots” survit très bien au colossal Anatomy publié à la toute fin de 2013. Structuré autour de 4 longs titres en mode minimaliste et toujours très évolutif, “Roots” propose un voyage entre les différentes étapes de Pyramid Peak depuis Ocean Drive jusqu'à ce jour. On y retrouve donc beaucoup d'éléments cosmiques, qui nourrissaient les ambiances des premiers albums du Peak, de même que ces mouvements de séquenceur qui structurent ces carrefours rythmiques en constant mouvement et dont les élans de crescendo nous donnaient constamment la chair de poule. Et comme rien n'est laissé au hasard dans le merveilleux univers du Peak, le duo Andreas Morsch et Axel Stupplich injecte de soyeuses orchestrations qui amplifient encore plus l'intensité des paramètres rythmiques dont les diverses mutations œuvrent à l'intérieur d'étonnants solos de synthés qui, en plus des effets harmoniques, jettent des nappes de brumes et de voix comme à la belle époque. La pièce-titre est plus ambiosphérique et son intro résonne comme du Tangerine Dream des années 70 avec des nappes brumeuses et des petites phases harmoniques qui génèrent une foule de souvenirs. Une voix pâteuse et des échantillonnages de voix décrivent l'histoire en musique du Peak, initiant une portion rythmique animée d'un croisement entre séquences et percussions avant que les synthés délient des boucles d'ambiances qui nous guideront à cette démarche de canard caquetant une structure organique qui boitille avec une subtile fluidité sous une avalanche de très bons solos. C'est le genre de titre qui nous fait voyager à travers nos rêves. "Milestones" est le point fort de “Roots” avec de belles longues minutes qui nous entraînent dans les territoires de Klaus Schulze et de sa collaboration avec Pete Namlook dans The Dark Side of the Moog IX. Splendide! De lent à indécis, le rythme progresse avec des percussions lourdes qui martèlent une paisible ascension du séquenceur. Les solos injectent des encres de feu qui dessinent des volutes paresseuses dont les torsades s'enroulent et se défont sur un rock cosmique qui explosera un peu après le point des 11 minutes avec un séquenceur vif qui oscille vivement sous de superbes solos de synthé toujours très musicaux. On écoute en boucle! Plus court titre de cette dernière aventure de Pyramid Peak, "Offshore" démarre lentement afin de nous exposer à une structure de rythme qui évolue comme si Chris Franke serait derrière le séquenceur. Les séquences sont agiles et se bousculent avec des cabrioles fluides, exposant d'autres séquences qui se joignent à une phase qui oscille comme les roseaux sous des vents chauds et dont les brises sont remplies de superbes chants séraphiques. Des chants qui sont présent à la grandeur de “Roots” qui étonne encore plus avec ses incontournables structures de rythmes en constantes mutations qui font de la musique de Pyramid Peak le rendez-vous des adeptes de la Berlin School, autant rétro que nouveau genre. I'm asking myself the same question quite often. Should I speak about it? Do I have to write about this 2nd album of the Norwegian band ARGH. Does it have its place in this vast library of EM that became Synth&Sequences? And then I said myself; why not? By respect for my readers and by respect to the AD Music label which aims at diversifying, in a wider range, the styles of its catalog, I told myself that to speak about it, if only just a little, can guide my readers towards a more sensible choice. And why this preamble? Because “Get it Right” from ARGH, standing for the initials of Andreas Ronbeck and Glenn Henrikson, is very far from this EM which livens up the debates here and which fires the curiosity of the aficionados of the Berlin School style and of all its derivatives. We are dealing here with an album of Synth-Pop, or Future Pop that depends of, with a singer and one or two keyboard players who are apparently inspired by the Depeche Mode model or by the Norwegian pop music band A-ha. And I imagine that the fact that Glenn Main Henriksen is behind this project helped this band so that it joins the ranks of the prestigious English label and thus to get more visibility. Who says Glenn Main, who says AD Music says quality! At this level, “Get it Right” won't have no difficulty to charm the fans of the kind. But is not Depeche Mode who wants! The music of ARGH, to say the least here, oscillates closer to the roots of romantic Synth-Pop and the bubblegum pink of the golden years of the kind and of MTV. The rhythms are little wild and the percussive effects are clearly less furious than in the structures of DM. I would go more to the kind Human League, especially when the voice of Iselin Main, Glenn Main's daughter, teams up with Andreas Ronbeck on vocals on titles as "No Romance" and the nice ballad "Run Away", of Howard Jones, Simple Minds or still Bryan Ferry in solo, in particular in "Wonderful Life", to describe better the 9 titles which lengthen hardly the 37 minutes of this album. There are good moments, like the very catchy "Night of the Living Synth", and many danceable titles which are built around dance beats like on David Bowie's Let's Dance if you want more reference tools. The approach remains very retro with rhythmic structures supported by beat-box percussions and very pastiches effects of the golden years of Synth-Pop. It's moreover one of weaknesses of this album. By offering a “Get it Right” more than seducing to the fans of the kind, the Norwegian duet (or trio?) forgets largely the innovative aspect. The sounds, the tones and the arrangements are in the heart of the 80's. It's agreeable, but more than 35 years later the kind has fairly evolved. Unless ARGH aims at the nostalgic. If it's the case, they aimed quite right! In brief; well-done Synth-Pop with tones of yesterday played with instruments of today. And it seems that the band is very good in concert with a highly inspired Glenn Main, who is quite a showman and who is surrounded by his daughter and son Nicko on keyboards. Je me suis posé la question assez souvent. Devrais-je en parler? Est-ce qu'une chronique à propos de ce 2ième album du groupe Norvégien ARGH avait sa place dans la bibliothèque de MÉ qu'est devenu Synth&Sequences? Et puis je me suis dit; pourquoi pas? Par respect pour mes lecteurs et par respect le label AD Music qui vise à diversifier dans un plus large éventail les styles de son catalogue, je me suis dit qu'en parler, ne serait-ce qu'un petit peu, peut guider mes lecteurs vers un choix plus judicieux. Et pourquoi ce préambule? Parce que “Get it Right” de ARGH, pour les initiales de Andreas Ronbeck et Glenn Henrikson, est très loin de la MÉ qui anime les débats ici et qui enflamme la curiosité des amateurs du genre Berlin School et de tous ses dérivés. Nous avons affaire ici à un album de Synth-Pop, ou de Future Pop c'est selon, avec chanteur et claviéristes qui sont visiblement inspiré du modèle Depeche Mode ou du groupe de musique Pop Norvégien A-ha. Et j'imagine que le fait que Glenn Main Henriksen soit derrière ce projet a donné un coup de pouce à ce groupe pour qu'il rejoigne l'écurie du prestigieux label Anglais et ainsi obtenir plus de visibilité. Qui dit Glenn Main, qui dit AD Music dit qualité! 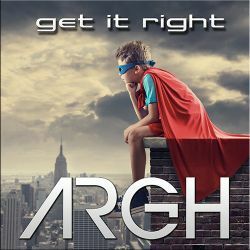 À ce niveau, “Get it Right” n'aura aucune difficulté à séduire les fans du genre. Mais n'est pas Depeche Mode qui veut! La musique de ARGH, à tout le moins ici, oscille plus près des racines du Synth-Pop romantique et rose-bonbon des années d'or du genre et de MTV. Les rythmes sont peu sauvages et les effets percussifs sont nettement moins endiablés que dans les structures de DM. J'irais plus dans le genre Human League, surtout lorsque la voix de Iselin Main, fille de Glenn Main, qui appuie le chanteur Andreas Ronbeck dans des titres comme "No Romance" et la belle ballade "Run Away", de Howard Jones, Simple Minds ou encore Bryan Ferry en solo, notamment dans "Wonderful Life", afin de mieux décrire les 9 titres qui allongent à peine les 37 minutes de cet album. Il y a de bons moments, comme "Night of the Living Synth", et beaucoup de titres dansables construits autour d'un Let's dance de David Bowie comme meilleur outil de référence. L'approche reste très rétro avec structures rythmiques soutenus par des percussions en boîtes et des effets très pastiches des années d'or de la Synth-Pop. C'est d'ailleurs une des faiblesses de cet album. En offrant un “Get it Right”, qui est tout de même assez séduisant, aux amateurs du genre, le duo Norvégien oublie grandement l'aspect innovateur. Les sons, les tons et les arrangements se situent dans la catégorie des années 80. C'est agréable, mais plus de 35 ans plus tard le genre a passablement évolué. À moins que ARGH vise les nostalgiques. Si c'est le cas, on peut dire mission accomplie. Bref; du Synth-Pop bien fait avec des tonalités d'hier rendues avec des instruments d'aujourd’hui. Et il paraît que le groupe offre tout un spectacle avec un Glenn Main inspiré qui est entouré de sa fille et son fils Nicko. Donc avis aux intéressés. To be a fan of Andy Pickford can turn out destabilizing! I am not a fan from the very beginning, but I learnt to know the artist and to like his music since the adventure of Spank the Dark Monkey and Binar in the early 2000's. And after an absence of about 10 years, he made a strong comeback with the Vanguard trilogy begun in 2015 on the AD Music label. Since then, he widely compensated these years far from the scene of EM with not less than 10 albums in 2 years. And each of those album hides traps of seduction, otherwise of addiction. That takes some doing! Destabilizing because AP touches everything with the fervor and a rage to put his fans on a foot of alert by jumping from a style to another with as much ease as grace. In so doing, each album becomes an opened door towards a wonderful world of sounds, of rhythms and of ambience which are as well attractive as puzzling, like in this “Vanguard III”. The adventure begins with a horn of plenty which let drops its sound prisms from the heavens, so pouring a delicate ethereal approach where ring a beautiful variety of celestial bells. "Free all Angels" leans from now on a purely electronic rhythm which is transformed into a good rock. The bass is throbbing and its humming sometimes gets lost in full resounding layers of which the hoarse radiances try to forge fine stroboscopic circles. The percussions are in the tone and the synths decorate a sibylline beautification with pearled harmonies and layers of absent voices, which murmur in the background of this decoration, and arrangements of trumpets which give a festive air to this liberation of the angels. The tone is given for an album where every title abounds in soundscapes which feeds completely the voracity of our ears. 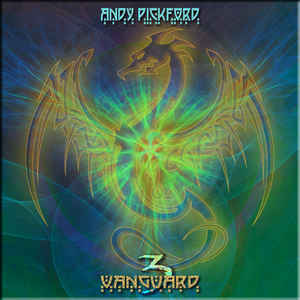 In 2012, Andy Pickford realized a series of 6 E.P. among which EP#04: Ritual. It's from this E.P. that is taken the very Electronica "Ritual (Electro music Mix)". A mixture between Techno and Trance Goa, the music is lively and jerky like in these electronic parties where we turn around beneath wild stroboscopic effects. Besides all his talents, AP sings! Like here with the slow dance beat which is "Could You Cry". The music flows behind a wide curtain of mist, so giving this tint to the voice of AP. The tempo is hyper slow and the arrangements influence an approach of a love song where cry superb synth solos. Lise loves it and I have to admit that it passes well enough. We stay in the field of ballad with "Rise" and its circular movement which increases its intensity gradually in order to explode in another good electronic rock. That becomes rather intense and the voice of a Berber woman adds a touch of exoticism to a strong title which will turn pale on the other hand in front of the well of intensity that is the powerful "Ahnenerbe". After a very glamorous electronic rock in "Schadenfreude", another title with an evolution controlled by an emotionalism amplified by diverse arrangements and especially by the presence of a good synth / guitar with striking harmonious soloes, "Ahnenerbe" nails us in our armchair. Very filmic, the music streams like a thousand of lapping which sparkle and sing as these circles which extend by the grace of a finger over the peaceful surface of a lake. Timid, the intensity of the circles increases its emotional and dramatic value with heavy percussions and orchestral arrangements, in particular this angelic choir, which give the shivers that our soul needs to confirm our thirst of life. It's powerfully dramatic and we search everywhere so that our ears swallows all of this sound scenario which ends up like a storm on the ice floes of time. The voices of the NASA and the electronic chirpings reminds us that with Andy Pickford, we can expect everything! Être un fan d'Andy Pickford peut s'avérer déstabilisant! Je ne suis pas un fan de la première heure, mais j'ai appris à connaître et aimer sa musique depuis l'aventure Spank the Dark Monkey et Binar au début des années 2000. Et après une absence de près de 10 ans, il revenait en force avec la trilogie Vanguard amorcée sur le label AD Music en 2015. Depuis, il a largement compensé ces années loin de la scène EM avec pas moins de 10 albums en 2 ans. Et chacun de ces albums cache des pièges de séduction, sinon d'addiction. Faut le faire! Déstabilisant parce qu'AP touche à tout avec la ferveur et la rage de mettre ses fans sur un pied d'alerte en sautant d'un style à l'autre avec autant de facilité que de grâce. Ce faisant, chaque album devient une porte ouverte vers un merveilleux monde de sons, de rythmes et d'ambiances qui sont aussi séduisants que déroutants, comme ce “Vanguard III”. L'aventure débute par une corne d'abondance qui échappe ses prismes sonores des cieux, coulant ainsi une délicate approche éthérée où tintent une belle variété de clochettes célestes. "Free all Angels" s'appuie dès lors sur un rythme purement électronique qui se transforme en un bon rock. La basse est ronflante et ses vrombissements se perdent parfois dans des nappes pleines dont les radiations éraillées tentent de forger des cercles stroboscopiques. Les percussions sont dans le ton et les synthés ornent un décor sibyllin avec des harmonies perlées et des nappes de voix absentes, qui murmurent dans le fond de ce décor, et des arrangements avec des trompettes qui donnent un air de fête à cette libération des anges. Le ton est donné pour un album où chaque titre regorge d'un panorama sonique qui régale à fond la gourmandise de nos oreilles. En 2012, Andy Pickford réalisa une série de 6 E.P. dont EP#04: Ritual. C'est de cet E.P. qu'est soutiré le très Électronica "Ritual (Electro Mix)". Un mélange entre le Techno et le Trance Goa, la musique est vive et saccadée comme dans ces fêtes électroniques où l'on tourne sous des effets stroboscopiques. En plus de tous ses talents, AP Chante! Comme ici avec les slow-tempo qu'est "Could You Cry". La musique coule derrière un large rideau de brume, donnant ainsi cette teinte à la voix d'AP. Le tempo est hyper lent et les arrangements influencent une approche de chanson d'amour où pleurent de splendides solos de synthé. Lise adore et je dois admettre que ça passe assez bien. On reste dans le domaine de la ballade avec "Rise" et son mouvement circulaire qui augmente son intensité graduellement pour exploser dans un autre bon rock électronique. Ça devient assez intense et la voix d'une femme berbère ajoute un touche d'exotisme à un solide titre qui pâlira par contre devant le puits d'intensité qu'est le puissant "Ahnenerbe". Après un rock électronique très glamour en "Schadenfreude", un autre titre à évolution contrôlée par une émotivité amplifiée par divers arrangements et surtout la présence d'un bon synthé/guitare avec des solos harmoniques criants, "Ahnenerbe" nous enfonce dans notre fauteuil. Très cinématographique, la musique ruissèle comme des milliers de clapotis qui scintillent et chantent comme ces cercles qui s'étendent par la grâce d'un doigt sur une paisible surface d'un lac. Timide, l'intensité des cercles accroit sa valeur émotive et dramatique avec de lourdes percussions et des arrangements orchestraux, notamment cette chorale angélique, qui donnent les frissons que notre âme a besoin afin de valider notre soif de vie. C'est puissamment dramatique et on fouille partout afin que nos oreilles gobent tout de ce scénario sonique qui se termine comme une tempête échoue sur les banquises du temps. Les voix de la NASA et les bipbips électroniques nous rappelle qu'avec Andy Pickford, on peut s'attendre à tout! A cosmic wave rises from the East. Chirping of birds welcome this cosmic layer filled of comfort and serenity. Quite smoothly, "Children of Andromeda" begins like these small moments of tenderness which overflowed from the horns of plenty in the time of New Age. A superb movement of serenity where even flows these small swash of sequences … But there you have it! Since Vandisphere, Vanderson has undertook a Dance, a Techno and even a Trance bend. And if we had forgotten it, it's with tact that Maciej Wierzchowski reminds it to us because "Children of Andromeda" goes from ambient melodic to a very Berliner movement of the sequencer which is chewed and, eventually disemboweled by flickering sequences sucking of ambiences and by percussions in Techno mode. The movement transits then from Techno to Ambient House with short ambiospherical phases where the sequences flit around like keys without direction in a rhythmic which is always reborn of its ashes. "Children of Andromeda" is the warning shot of an album which aims to be merciless for the fans of Berlin School who savored the first opuses of the Polish synthesist. Except that we have to throw an ear behind these furious rhythms, because beyond all Vanderson tempts an union between those kinds which feed the Electronica and a Berlin School which hangs on here due to the sequencer and the ambiences. Which is not completely the case of "Outer Space" and its very Ambient House introduction with a touch of the 80's (Frankie Goes to Hollywood) and a very Underworld approach. Slow but filled of a ambiospherical heaviness, this rhythm is encircled by a line of stroboscopic sequences and decorated with a really catchy melody which is thrown by a synth more creative than lobotomized. The 2nd part is more lively, more energetic with thin lines of epileptic sequences which show more quickness. "Reality" is my first crush in “Beyond Time Structure”! After an introduction in the kind of sci-fi, the sequences fly lightly with hesitation before forming a slow and heavy aerial rhythm, as I like them, decorated with small jolts and with these small hoops which collide and form a line of jerky sequences. The percussions get fit to the beat and the union between them and the sequencer creates a light movement of gallop that a synth decorates of nice electronic syllables, as those in "Outer Space". Delicious from start to end which livens up with more liveliness. "Underwater World" is in the very Dance style. The intro is always imagined with electronic tones which evaporate in a phase of atmospheres. The lines of sequences are held in suspension, like these spatial squadrons which wait and flutter before diving towards an intergalactic war. They wait for a line of bass which gallop slowly and percussions which hammer a static rhythm with elastic doom-doom. This introductory spiral dives towards a steadier structure and wrapped with an approach of electronic effects which flirt a little with the model psybient. The more "Underwater World" moves forward and the more we feel this attraction towards a Goa Trance a la Jarre, Électronica era, with chords which spin in a circular and jolting approach. A little less long and that would have been better! Like with "Invisible Contact" which is slower and which is decorated with good solos which flee from the movements of acrobatic spirals. "Sensible" is in the kind of thing that I like, either a good slow beat with nice harmonies whistled as a walker admiring the landscapes. Certainly, there are Techno and dance effects as well as with robotics percussions and stroboscopic strands....but that remains a music of electronic dance (EDM) and that passes better in this little less wild approach. "Time Travellers" is the least energetic title of “Beyond Time Structure”! It always stays in the kind EDM, but with a slowness which places it between an E-rock and an EDM in an electronic decoration always so cosmic … as electronic. Une onde cosmique s'élève de l'Est. Des pépiements d'oiseaux accueillent cette nappe cosmique remplie de confort et de sérénité. Tout en douceur, "Children of Andromeda" débute comme ces petits moments de tendresse qui débordaient des cornes d'abondance du temps du New Age. Un splendide mouvement de sérénité où ruissèle même ces petits clapotis de séquences…Mais voilà! Depuis Vandisphere Vanderson a entrepris un virage Dance, Techno et même Trance. Et si on l'avait oublié, c'est avec doigté que Maciej Wierzchowski nous le rappelle car "Children of Andromeda" transite de l'ambiant mélodique à un mouvement très Berliner du séquenceur qui se fait mastiquer et, éventuellement, éventrer par des séquences papillonnantes et suceuses d'ambiances et des percussions en mode Techno. Le mouvement transite alors de Techno à Ambient House avec de courtes phases ambiosphériques où les séquences volètent comme des ions sans direction dans une rythmique qui renaît toujours de ses cendres. "Children of Andromeda" est le coup de semonce d'un album qui se veut sans pitié pour les amateurs de Berlin School qui ont dégusté les premiers opus du synthésiste Polonais. Sauf qu'il faut jeter une oreille derrière ces rythmes endiablés, car au-delà de tout Vanderson tente une union entre ces genres qui nourrissent l'Électronica pur et dur et le Berlin School qui s'enracine de par le séquenceur et les ambiances. Ce qui n'est pas tout à fait le cas de "Outer Space" et de son introduction très Ambient House avec une touche des années 80 (Frankie Goes to Hollywood) et une approche très Underworld. Lent mais plombé d'une lourdeur ambiosphérique, ce rythme est ceinturé d'une ligne de séquences stroboscopiques et orné d'une mélodie vraiment accrochante qui est lancée par un synthé plus créatif que lobotomisé. La 2ième partie est plus enlevante, plus énergique avec des filets de séquences épileptiques qui affichent plus de vélocité. "Reality" est mon premier coup de cœur dans “Beyond Time Structure”! Après une introduction dans le genre sci-fi, des séquences volètent avec hésitation avant de former un rythme aérien lent et lourd, comme je les aime, orné de petites secousses et de ces petits cerceaux qui s'entrechoquent et forment une ligne de séquences saccadées. Les percussions s'ajustent et l'union entre elles et le séquenceur crée un léger mouvement de galop qu'un synthé décore de belles syllabes électroniques comme celles dans "Outer Space". Savoureux du début à une fin qui s'anime avec plus de vivacité. "Underwater World" est dans le genre très Dance. L'intro est toujours imaginée avec des tonalités électroniques qui s’évaporent dans une phase d'ambiances. Des lignes de séquences se tiennent en suspension, comme ces escadrilles spatiales qui font du surplace et volètent avant de plonger vers une guerre intergalactique. Elles attendent une ligne de basse qui galopent doucement et des percussions qui martèlent un rythme statique avec des doom doom caoutchouteux. Cette spirale introductive plonge vers une structure plus soutenue et enrobée d'une approche d'effets électroniques qui flirtent un peu avec le modèle psybient. Plus "Underwater World" avance et plus on sent cette attirance vers un Goa Trance à la Jarre, période Électronica, avec des accords qui virevoltent dans une approche circulaire et saccadées. Un peu moins long et ça aurait été mieux! Comme avec "Invisible Contact" qui est plus lent et qui est agrémenté de bons solos qui fuient dans des mouvements de spirales acrobatiques. "Sense" est dans le genre de truc que j'aime, soit un bon beat lent et entraînant avec de belles harmonies sifflées comme un promeneur admirant les paysages. Certes, il y a des effets Techno et dance avec des percussions robotiques et des filets stroboscopiques…mais ça passe mieux dans une approche un peu moins sauvage. Mais ça reste une musique de danse électronique (EDM). "Time Travellers" est le titre le moins énergique de “Beyond Time Structure”. Ça reste toujours dans le genre EDM, mais avec une lenteur qui le place entre un rock électronique (E-Rock) et l'EDM dans un décor électronique toujours aussi cosmique…qu'électronique. 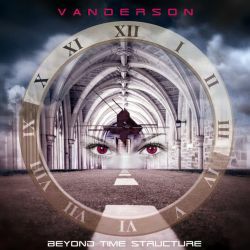 “Beyond Time Structure” propose un nouvel opus d'un Vanderson qui n'est plus, à tout le moins pour l'instant de cet album, le Vanderson que j'ai découvert avec Visions en 2011. Mais il faut savoir évoluer! Non? Et sur le label de MellowJet, et avec la complicité de Bernd Scholl, son approche EDM est savoureusement mise en valeur par tout le savoir du boss de MellowJet Records qui adore tisser ce lien entre l'EDM et le côté Berlin School du rock électronique. Ça m'a pris quelques écoutes, mais j'ai finalement succombé aux charmes de quelques titres. Un album digne de la très grande diversité du label Allemand MellowJet Records.